Cynthia Pearson shares the first in a two-part blog series about their May trip to Door of Hope and visiting Luke, Annamarie Pearson and family. We are happy to have another guest blog to share with you. Mitch and Becky McCarthy visited over Thanksgiving in November 2013. Becky writes about how the time challenged and blessed her. Her musical talents were a blessing to the students and staff. In the last post, Erin wrote about packing 22 boxes full of clothes and school supplies from Calvary Christian Church in Royal Oak, MI for Door of Hope. Now we hear from Annamarie about the receiving and giving on Palawan during the annual Pastors convention. We are thrilled to have a guest blog today by Erin Kleist. Erin and Hannah traveled to the Philippines last May for a month. Their trip led to an endeavour we asked them to share with you. We thank Erin and Hannah for their hard work along with all the great people at Calvary Christian Church. The past few months have been difficult for the Philippine Islands as they have been hit by earthquakes and then Super Typhoon Yolanda. Door of Hope only experienced heavy rains and some wind, but no damage. There were a few churches in Philippine Christian Fellowship (with whom Door of Hope is affiliated) that sustained damage. Filipinos are a resilient people who weather tough storms. 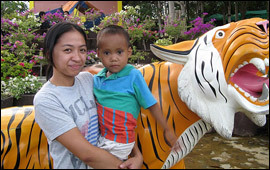 Annamarie writes about the challenges and hope that they are experiencing at Door of Hope Palawan. Baguio is situated in Luzon at a higher elevation with cooler temperatures than most of the Philippines. With the rich soil, it is the produce capital of the country. There is a new church here in the Philippine Christian Fellowship that Luke and Annie visited. At Door of Hope and the Bible School live some hard workers who are developing entrepreneurships and endeavouring to be self supporting. Read about their efforts and join with them in prayer for God's help and blessing. Wow!! What an awesome start to the 2013-14 school year! We had two enthusiastic college students from Detroit, Michigan come and visit us for three weeks to help kick off the new school year.